Following the 15 goals on Saturday, the combined Premier and First Division goals scored on Sunday took the total to 41 for the weekend in Bermuda Football Association action. At the Devonshire Rec. Robin Hood would be ruining missed chances as they finished scoreless with the Devonshire Cougars. Robin Hood had a man advantage midway through the first half after Demetre Daniels was shown his second yellow card, but the game that finished without a goal saw both teams finish with 10 men as Lejuan Simmons was shown a straight red card for shoving a Devonshire Cougars player. At the Southampton Oval, visiting North Village Rams defeated the Paget Lions 4 – 0. Jaizel Smith-Deshields would lead the North Village Rams to victory with two goals, while Marcelos Thomas and Pierre Smith added a goal each. At the St. John’s Field, the Dandy Town Hornets would defeat BAA 3 – 2, twice coming from behind to do so. Keishen Bean gave BAA the lead in the 18th minute, but 8 minutes later the Dandy Town Hornets were level when Nizigh Spence scored. BAA would go back in front in the 31st minute when Bean found trhe back of the net for a second time, but again the Dandy Town Hornets would find an equalizer which came in the 47th minute through a Kwame Steede strike. The winner would come in the 81st minute for the Dandy Town Hornets through captain Angelo Simmons. 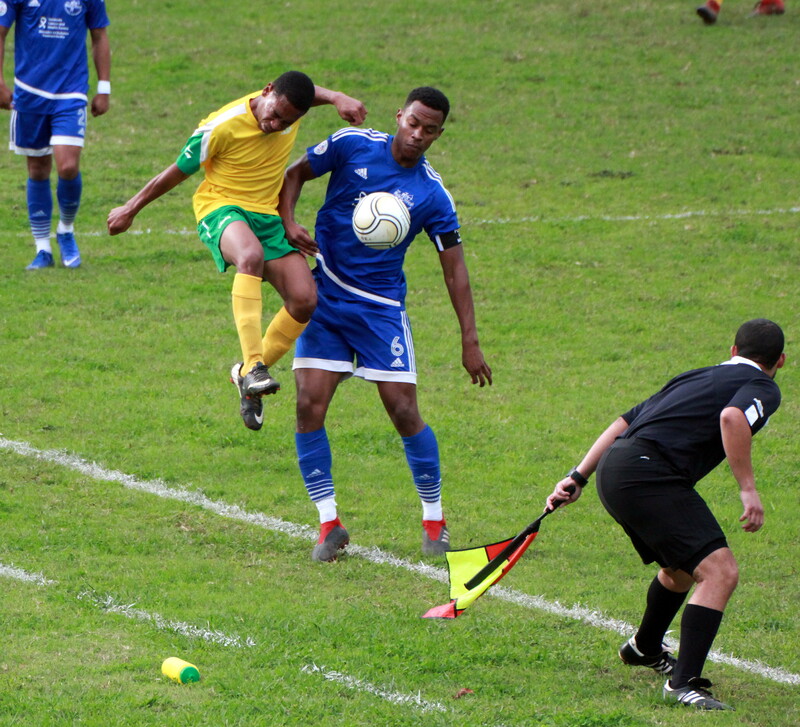 At the Wellington Oval, the St. George’s Colts defeated visitors Flanagan’s Onions 4 – 1. Jahki Brangman gave the host the lead in the 21st minute, and on the stroke of half time David Signor would double the lead after he converted from the penalty spot. Sage Paynter would give the St. George’s Colts a 3 – 0 lead when he scored in the 58th minute, Paynter would again find the net in the 66th minute to make it 4 – 0, Paul Smith would pull a goal back for the Flanagan’s Onions in the 76th minute. At Lord’s in St. David’s the home team would emerge victorious 3 – 1 over Young Men Social Club. St. David’s would get single strikes from Kamali Davis, Kurtis Minors and Kontai Burton, while the lone goal for Young Men Social Club was an own goal. At the Southampton Oval, League Leaders Southampton Rangers scored eight unanswered goals against Ireland Rangers. The Southampton Rangers would get two goals from Jarazhino Bassett and Donte Brangman, while Isaiah Taylor, Quadir Maynard, Jahkai Hill and Ezekiel Stoneham all added a goal each.